We offer one option with our Mosquito and Tick Program is effective at protecting your property and health. Information on the organic products are below. This program requires a 1x per month treatment from spring until fall, typically April-October depending on the weather, which is peak activity time for disease carrying mosquitoes and ticks. 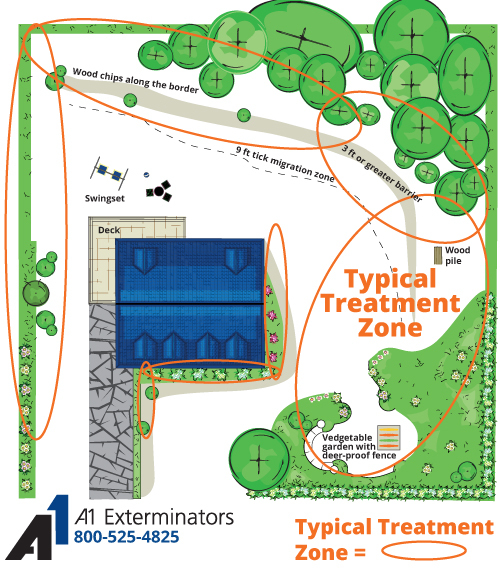 The treatment is applied to areas around your property where ticks and mosquitoes congregate. You can expect a reduction in mosquito and tick populations around your home. What this simply means is less pests and less risk from the diseases caused by these pests. This program has been thoroughly field tested and you can expect immediate results after the 1st treatment, but even greater results over the course of consecutive months. Bottom-line is this program gives you back your yard! You can expect a pest free yard day and night all spring and summer long. These pests are tiny and very difficult to spot and can easily go unnoticed. But if they bite and get a hold of you, your family members, or pets, they could be very harmful. Ticks can carry and transmit diseases such as Lyme Disease. Tick bites can be painful and cause skin inflammation, secondary infection and could start forming microorganisms that spread disease. It’s your yard, not the ticks’. Let’s defend it. Our treatment program that is very effective at protecting your property and health, by combining power of a knockdown agent, long-lasting insecticide, synergist and Insect growth regulator in one single product with controlled-release technology. Take it back from these pests. Ticks are related to mites, spiders and scorpions, but are not considered an insect. Ticks have eight legs and insects have only six. Ticks develop in four stages: egg, larva, nymphs and adult. After mating on a host, female ticks drop to the ground then lay anywhere from 3,000 to 6,000 eggs. The eggs then hatch into larvae which are also referred to as seed ticks. Larvae collect in large groups and wait for an animal to pass within reach. After feeding on the host, the larvae then drop to the ground again and shed their skins. The larvae have now turned into nymphs. A nymph follows the same process as the larvae in the way that it finds a host to feed on then, drops to the ground and sheds its skin. However, at this time, the nymph will become an adult. Adult ticks will then seek a host to feed and mate. Adult ticks will only mate while on a host animal. Male ticks will mate one or more times and then usually die, but some may live for months after mating. Female ticks die shortly after the process of laying eggs. 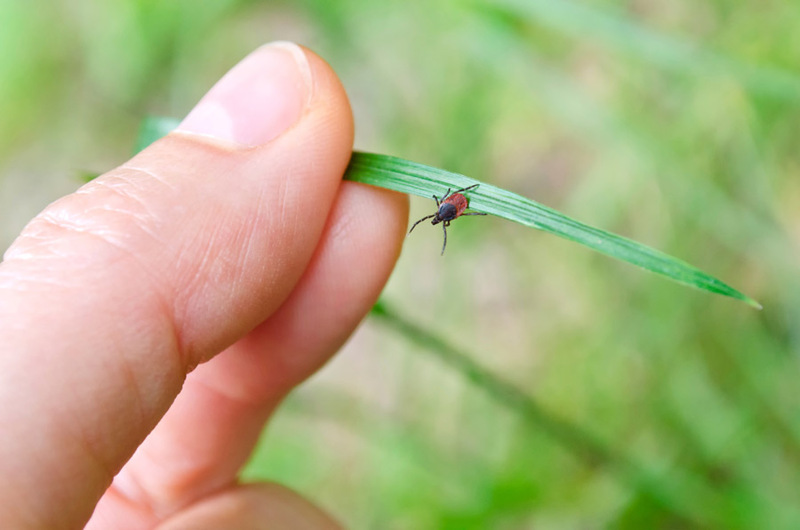 Certain ticks can have a life cycle from two months or up to two years. There are several different types of ticks found in New England. Two of the most “high risk” areas are Massachusetts and Rhode Island. According to the Centers for Disease Control tick-borne diseases is an epidemic forming in the United States. Our tick control program can help keep you, your family and your pets safe. Lyme disease: an illness from getting bitten by a tick infected with a certain type of bacteria. The most feared tick-borne illness is Lyme disease, which is spread by ticks so small that they often go unnoticed and is named for the Connecticut town where Yale researchers first traced the disease back to insects. It can cause fatigue, headache, stiff neck, fever, sore muscles and joints, and sometimes a red rash that looks like a bull’s-eye. Rocky Mountain spotted fever: a bacterial infection passed to humans by wood ticks and dog ticks that can lead to life-threatening complications, such as shock and kidney failure, if it is not treated promptly. 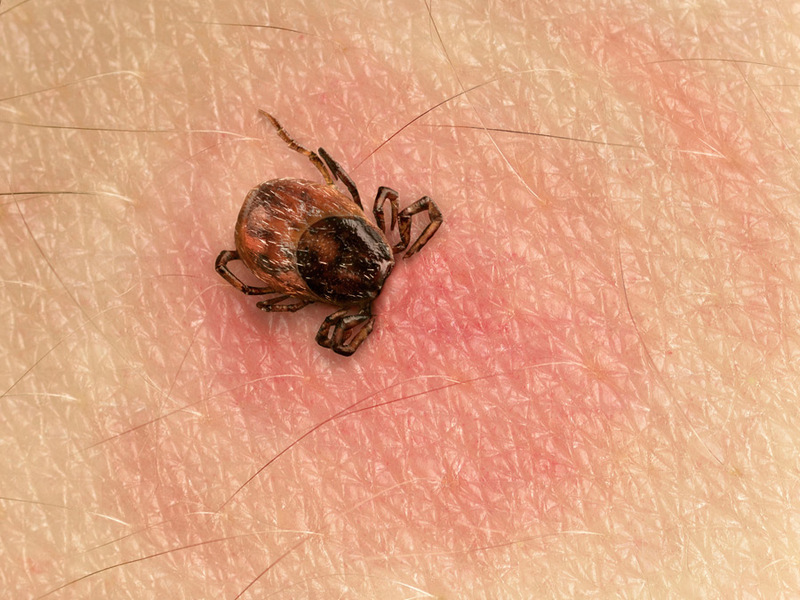 Initial symptoms usually start about 2 to 14 days after the tick bite and may include a sudden fever, severe headache, muscle and joint aches, distinct rash, and nausea and vomiting. Tularemia: also called deerfly fever or rabbit fever, is a disease that usually occurs in animals. But the disease can be passed to people through infected insects or animals or by exposure to contaminated water or dust. Ehrlichiosis: an infectious disease that can be passed to humans by ticks. It causes fever, chills, headache (often severe), general ill feeling (malaise), nausea and vomiting, and a purple or red rash. Relapsing fever: an infectious disease that can be passed to humans by ticks. Relapsing fever is most common in the western United States. Colorado tick fever: an infectious viral disease that can be passed to humans by ticks. Colorado tick fever occurs in the mountain region of the western United States, not here in New England. Babesiosis: a rare parasitic disease that can be passed to humans by deer ticks. With A1 Exterminator’s Mosquito and Tick program, you can feel safe and comfortable in the yard of your home or outside your business while enjoying a rewarding outdoor lifestyle. Take it back from these pests. Our Seasonal (April – October) A-1 Mosquito and Tick Program is payable by Credit Card only. We accept all major cards as form of payment. After you sign-up, one of our representatives will contact you to review the program and set-up your monthly payment. This service is a monthly recurring fee.